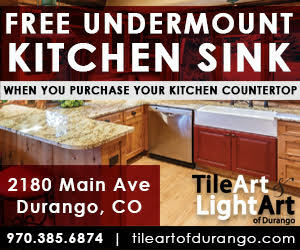 Come and visit Durango's largest granite countertop fabrication and slab yard in Bodo Park. Tile Art manufactures and installs all of our granite countertops using the latest machinery and state of the art techniques. Our passion is in tile! 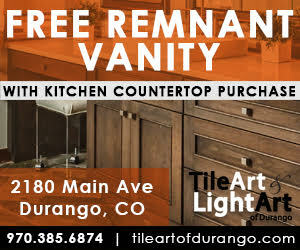 From design, free quotes, and estimates to a huge showroom, selection, and installation - Tile Art of Durango is one place you must visit for your next building or remodeling project. 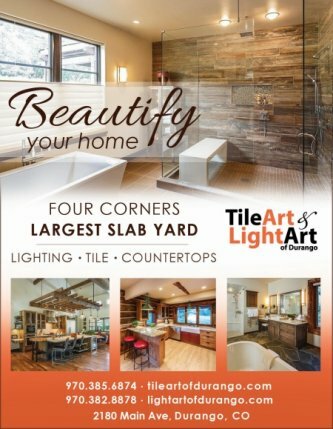 We are the local distributor for many of the larger tile companies, such as American Olean, Arizona Tile, Bedrosian’s, Capco, DAL Tile, Emser Tile, Florida Tile, Petraslate, and Longust. 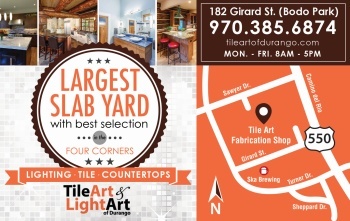 If it's Specialty Tile that you're looking for, we feature products from these distributors and many more ... the point is, you've got to come and see our showroom! Alyse Edwards, Bati Orient, Carmel Stone, Cosa Marble, Island Stone, Jeffrey Court, Maniscalco, Oceanside Glass, Original Style, Seneca & EPRO Tiles, and Terra Verre. If you're looking for something from a company that we don't display, let us know and we'll be happy to make the extra effort to find it and source it for you. 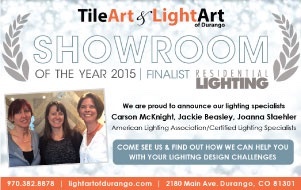 Light Art of Durango is the Premier Lighting Showroom in the area! You can browse online here. We have certified lighting experts to help you with all your lighting needs! We do shower door and countertop installs, but no tile - however we do require that your countertop is installed by us if you buy material from us (we want to make sure it is done properly with the right tools and trained professionals). For installation of all our other products, we do have a list of "recommended installers" which we will gladly provide to you for your installation needs. We have personally seen the work of all these installers and know that they meet Tile Art's high standards.